Matawan and Rumson-Fair Haven Win CJG2, Hart Drops a Sub-9! 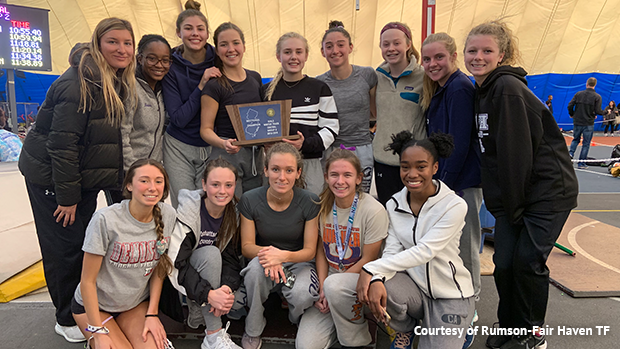 For the Rumson-Fair Haven girls, totaling 61 points, this is their sixth overall title and their second straight, could this be the start of another run like they had winning four straight from 2012-2015? The Matawan boys victory moves their total to seven, they last won in 2016 when they had a four year streak starting in 2013. There was also an amazing individual effort from Devin Hart of Pt. Pleasant Boro in the 3200m run, lapping the field and crossing the line with a US#1, NJ#8 all-time, performance of 8:59.32. His splits were 2:12, 2:16 (4:28), 2:16, 2:15 (4:31). This was after already running 4:22.74 to win the 1600m earlier in the meet! You can watch that race in the video above. Rumson's attack scored in six of the ten events, their only individual winner was Lily Orr who took home the 400m at 58.46. Orr also finished second in the 55m dash running 7.48, had a 7.45 in prelims. They had sixth place finishers in both those events with Olivia Rehder 60.48 in the 400m and Maddie Orr 7.67 in the 55m. The girls had a day in the 800m and 1600m as well going 2-3 in each, Eliana Swell finished second in both events running 2:21.59 and 5:11.65. Behind her in the 800m was Olivia Rehder, 2:22.72, and Julia Tambaro the 1600m, 5:19.22. The Rumson girls also picked up points in the hurdles thanks to Alina Arko, 9.17 for fourth, and Campbell Devlin, 9:32 for sixth, as well as the 4x400m relay where they ran second at 4:09.27. 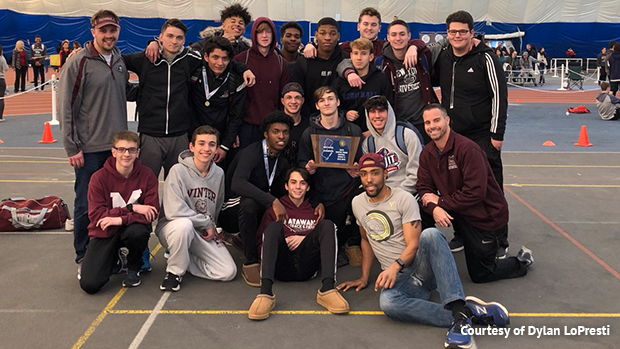 The Matawan boys victory came through to the tune of four event wins split between the track and the field. In the field Noah Colleton won the high jump with a season best of 5-08, his teammates Dominic Allen and Laurence Wilson also picked up third and sixth at 5-08 and 5-06. The pole vault saw Anthony Ferrara clear 13-0 for the win. On the track they won the 800m courtesy of Dylan LoPresti at 1:59.27, teammate Charlie Serrano third at 2:01.45, and the 4x400m running 3:25.59. Zachery Hall brought in nine points thanks to his second place 400m run, 50.37, and sixth place finish in the 55 dash at 6.88. Serrano was also third in the 400m dash running 51.12. Other highlights included...Sydney Todd of Monmouth Regional won the 800m and 1600m running 2:20.47 and 5:11.48, her teammate Samantha Ragenklint broke the 3200m meet record with her 10:55.40. The previous standard was 11:01.16 held by another Monmouth Regional athlete, Amanda Stone, since last year. Meredith Updike of Cinnaminson won the 55m hurdles running 8.60. Alexis Peterson of Rahway earned gold in the 55m dash at 7.42, her teammate Kailah Turner the shot put winner with 36-04.5. Holmdel won the 4x400m with a 4:07.28. Robbinsville's Chelsea Manto cleared 4-10 to take the high jump. Riley Larsen of Pt. Pleasant Boro vaulted 10-06. For the boys Jared Conte of Ocean Township won the 400m with a 50.34. Ola Akande of Rahway posted 7.55 to win the 55m hurdles. Daniel Duncan of North Plainfield a 6.54 for gold in the 55m dash. Hopewell Valley's John Muoio threw a mark of 49-05.75 to win the shot put.